You may be able to save someone considering suicide -- with the help of new features soon to be available through Facebook. In a post published Wednesday, the social network said it has expanded the support available to potentially suicidal people. Aware that its network includes a community of more than 1 billion active users, Facebook has already taken steps to try to help people thinking of suicide. In 2011, the company launched a service that allowed users to chat live with a suicide prevention specialist. Another feature introduced at the time lets you click the "report" link if something concerns you. "Currently, if you flag a post or account from someone whom you believe may be suicidal, Facebook will take over the process from there," Facebook said. In addition, Facebook has said that if someone sees a "direct threat of suicide" that the person should contact "local emergency services immediately." Now, the social network is expanding the resources available on both sides. 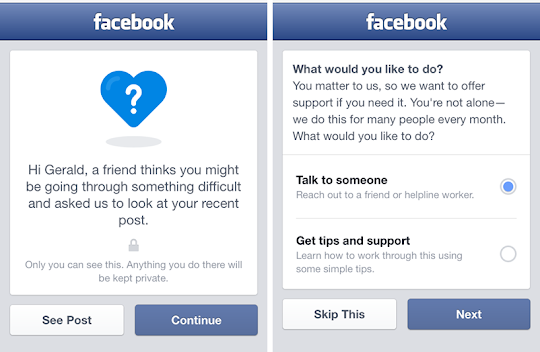 For those considering suicide, "we now also give them the option of reaching out to a friend, and provide tips and advice on how they can work through these feelings," according to Facebook. In addition, the person reporting the concern will be offered more assistance. "We're also providing new resources and support to the person who flagged the troubling post, including options for them to call or message their distressed friend letting them know they care, or reaching out to another friend or a trained professional at a suicide hotline for support," Facebook noted. Facebook has also added videos and other information available to people who may be having suicidal thoughts to serve as additional help. In introducing and expanding its suicide prevention features, Facebook has worked with several mental health organizations, including Forefront, Now Matters Now, the National Suicide Prevention Lifeline and Save.org. The company said it has also spoken with people who have attempted to harm themselves or have other personal experience with suicide. The new features will roll out to all Facebook users in the US over the next couple of months. Facebook said it's also trying to improve its suicide prevention tools for people who live outside the US.